All of the albums contain a variety of 19th century American music. 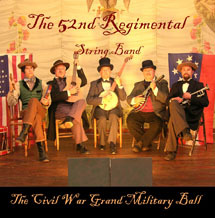 Military songs, parlor songs and minstrel songs make up the bulk of the styles. There is also a mixture of slow beautiful songs and rousing fast ones. Most songs contain vocals, although a few are instrumental only. All of the songs were written before or during the American Civil War that ended in 1865. Using original sheet music of the era, the band strives to reproduce the vocals and music the way they were written and performed long ago. May be ordered on Amazon.com for $14.99 each; however, they do not have discounts.